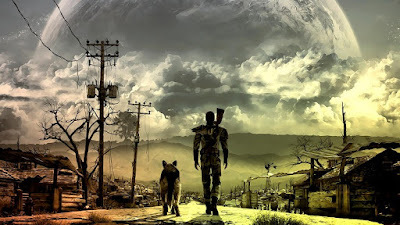 Fallout is one of the major game franchises that passed me by - primarily because I'm a hard sell on shooters, though the Fallout series did have more of a reputation for story than most others. It's also what's known as a 'sandbox' game, which usually means there's a ton you can do, and a thousand different paths to get there. It's a rare sandbox game that doesn't exhaust me long before the main quest ends (eg. Skyrim). Fallout 4: There is no massive moon hanging in the sky in the actual game. 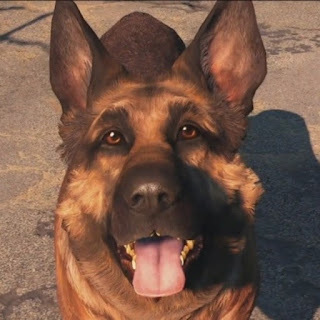 Still, I picked up Fallout 4 at least in part because of the slick graphics, and because of the positive reviews. And also because of some of the cartoons going around showing the character creation process, where you get to design both yourself and your spouse (though cannot choose the gender of your spouse - and, minor nitpick, the child waiting in the next room does not appear to reflect any of the appearance changes you might make [though I've heard that the appearance is supposed to be generated according to the parental appearance]). 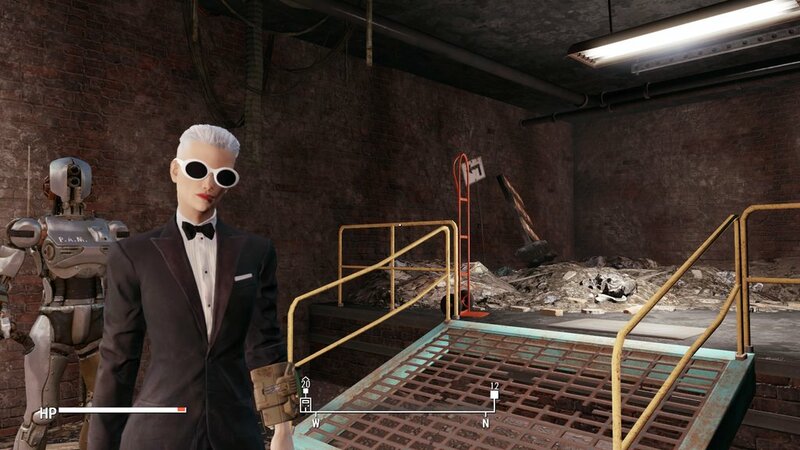 Dressing for success in the post apocalypse. Lucky there's plenty of laundry cleaner scattered about. Starting at the fourth game in series isn't a big bar to new players, since each of the Fallout games starts with a new character (dubbed "the Lone Wanderer"), who emerges from a vault after a nuclear war that has devastated a fission-tech Earth around 2077 (an alt-reality that seems to be going for a Stepford Wives vibe). In Fallout 3 I gather you start the game as a child born in a shelter, but Fallout 4 adds a twist of cryo-storage and you go through a brief starting sequence of your family being frozen in their shelter, your character waking briefly to see their child stolen and their partner murdered, then frozen again before being properly released. The double-freezing leads to an obvious twist, though there is a nicely-done fakeout in relation to your search for your stolen child. However, long before you get anywhere near your child's trail, you must deal with "the Commonwealth" (set around the ruins of Boston), where the law has almost completely fractured following the fall of the Minutemen. They are the first of four factions you encounter and you can choose to help out, and start re-establishing protected settlements (and get lost in an entire side-game of clunkily building houses, decorating them, and setting up defences and supply lines). The other factions are the Brotherhood of Steel (basically a variation of Nazis, always talking about purity and wanting to kill off everything not-quite-human), the Institute (a shadowy super-tech place which everyone in the Commonwealth is convinced is, for some reason, replacing people with replicants called synths), and the Railroad (a group dedicated to helping synths escape the Institute). On the whole, I found Fallout 4 to be compulsively playable - tons of little quests, and a landscape seething with life. I racked up between 4 and 5 full days played before I completed the main quest line and decided 'no more' (there is scope for continuing on with minor quests near-indefinitely). At the same time, I didn't find the main quest particularly compelling - especially once you get to meet with the Institute. Part of that is, I think, because I didn't find the Institute leader's actions at all believable (ludicrous, in fact). There is also very little option to try to convince any of these factions to change their views, even when some of the leader's actions in particular suggest he's not nearly so firm on the major divisive issue as his words would suggest. There are a ton of potential companions - so many I didn't even find them all - and the companion quest lines, unsurprisingly, are some of the more interesting segments of the game - and the voice acting overall there is just fabulous. My faves were Dogmeat (the iconic german shepherd companion, who is just glad to be around you - I felt bad every time I swapped him out as a companion), Hancock and Nick Valentine. The game is also swimming in bugs (some of them shoot streams of maggots at you, but the rest just mess with the gameplay). Most don't cause major issues, but it's worth saving frequently. Recommended for: anyone who has several weeks free, and doesn't have a book they're supposed to be writing. First, yes, very good movie. Much fun, high pace, some tears, lots of awesome. Star Wars as a series has a real thing about spaceship adoration, and spaceship adoration definitely gets lots of love. As the post title suggests, there are a _ton_ of parallels, of similar events from the first movie happening to different people, but it's done very well. Rey is all kinds of awesome, and I especially love her 'girl engineer' aspects, and where that leads her in terms of emotional resonance. Finn is a great big sweetheart, and while I don't think Finn/Poe is where they're going, they totally should (though perhaps give Poe a little more plot-time so he gets to have a personality as well as a jacket). I only have a couple of negatives. First, could have done with more Leia and more Phasma. Second, Kylo Ren's parallel is from the prequels, which is not a good thing: here's someone we're supposed to see in conflict, but instead we (or at least I) mainly saw a fairly stupid, temperamental jerk. But still, definitely already looking forward to the next one, and especially finding out the things about Rey that we didn't find out in this movie. Will rewatch when it comes to TV. One of the things I very commonly come across in SFF discussion is someone saying that the aliens/werewolves/angels/other things are 'truly alien' or 'look and behave just like humans', where one is a compliment and the other criticism. Every time I come across this sort of thing, I stumble. Not because I don't get what they're saying, but I wonder what boundaries they're intending to draw. What makes an alien 'alien'? 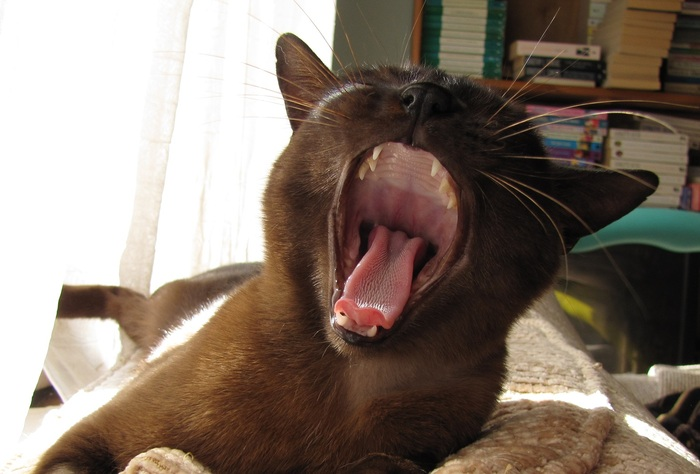 While 'does not look human' is an obvious thing, here's my cat Cinnamon. She doesn't look particularly human either. Does that make her 'alien'? Cinnamon and I are not much alike. She likes racing madly up and down corridors, scratching things, and has a magnificent twitch reflex should a string move suspiciously anywhere in her field of view. She eats stuff that would make me vomit. She has no command of English, though she's a rather verbal cat, and won't hesitate to meow loudly until her humans try to guess what she wants. She isn't into computer games or reading. And yet Cinnamon and I and thousands of other creatures are very alike. Earth itself is full of things not so very unlike Cinnamon, and yet all theoretically different from each other. All of them share a drive to reproduce (or, well, we wouldn't know about their species at all). All seek food of some sort, and an ideal environment. The more complex ones generally exhibit fear, aggression, curiosity, play and something that at least appears to humans as affection. I don't think anyone is arguing that 'aliens' could not exhibit these qualities. But these are animals, and not at the intelligence level of the type of alien that SFF readers are talking about – a being that would be able to communicate effectively with humans if given access to language lessons and whatever mechanical aids might be necessary, while remaining 'truly alien'. I think we can effectively divide aliens into 'physically similar to humans' and 'have a strong dissimilarity to humans'. Cat-ancestry people, for instance, might claw stuff and have a tendency to pounce, but they're still mammals, with live births, milk feeding, and the food-in/poop-out process. Then you have, say, the 'piggies' from Orson Scott Card's Speaker for the Dead (where reproduction is…different from the standard mammalian process) but otherwise these are creatures that exhibit a similar range of drives and emotions to humans. Thirdly the 'completely different' – living rocks, or energy beings that have little to no concept of many human physical experiences – but could still presumably produce fear, aggression, curiosity, play, affection. No-one is arguing that 'truly alien' aliens must not have emotion, or biological imperatives. If you don't go in for large physical differences, a lot of what people point to as 'alien' seems to be "non-Western culture" – and if you got into the alien's POV, they would read very much as humans of a different culture. Different cultures are very interesting! Altered experiences caused by physical differences are also very interesting! But surely we're not arguing that beings with cultural and physical differences are intrinsically non-human. Cognative differences takes us into more complex territory. Humans have cognative differences too, and I'm sure no-one who is talking about "alien aliens" means to say that non-neurotypical humans are 'alien'. Where does the line get drawn? We have humans with synesthesia. We've seen robots depicted with depression, or aliens who in theory have no concept of lying, or don't understand death or love or friendship. And, to be honest, most of this latter type of 'alien' reads as extrapolated concepts to me, constructed to create a plot. I am vastly, vastly more inclined to believe that if we somehow overcome the echoing hollows of space and stumble across a few intelligent alien species…we'll get a bunch of creatures that look an awful lot like Earth creatures – and probably act like them as well. Aliens because 'not from here', and with some physical differences, and big cultural differences, and not 'truly alien aliens' at all. What do you all think? If we started planet-hopping, would you be all that surprised to find mammals? Cats? Bipeds with roguish grins, a taste for scotch, and a nice line in leather jackets? At what point do you throw up your hands and cry: "These aliens may as well be human!"? On 1 December 2010 I published Champion of the Rose and The Silence of Medair (on the same day, to make the question of 'my first book' a matter of some quibbling). While it would have been a nice bit of symmetry to publish The Sleeping Life this month, it looks like it's going to be a late January-at-earliest publication. This time I'll combine it with a fun survey (well, fun for me). You can fill in the survey without entering to win (or enter without filling in the rest of the survey), and the competition will remain open until the day before release (whenever, sigh, that happens to be) is closed now.